A local Christian community had been waiting to build its church for two years. The Assemblies of God Church had the necessary permits, and the land destined for construction is private property. Currently, 25 churches are shut and guarded by police in the same state. 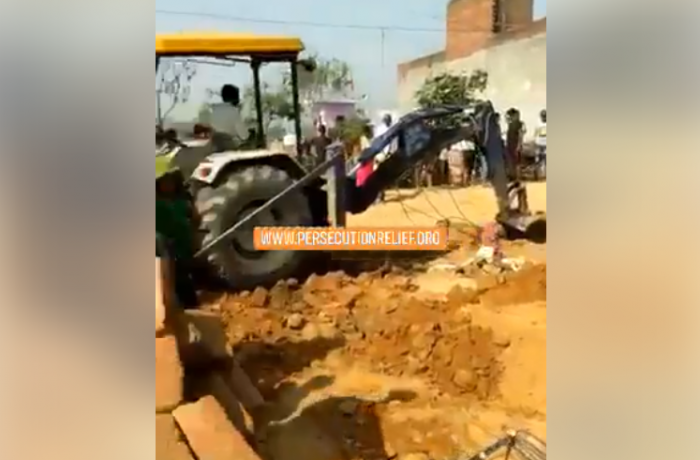 New Delhi (AsiaNews) – More than 150 Christians in Atrauli, a city in Aligarh District, Uttar Pradesh, watched powerless as the initial work on their church was torn down. The members of the Assemblies of God (AG) Church had waited for two years before they got the right papers authorising construction. The demolition of their would-be church is the umpteenth example of discrimination against Christians, this according to Persecution Relief. Shibu Thomas, the Christian NGO’s founder, blames local religious fanatics led by the “chairman of the Municipal Council” who said “as long as I am here, I will make sure the church is not built”. Two years ago, Rev Raju Abraham, who has headed the local AG community for ten years, obtained the permits needed to build a church on private land, about 165 square metres. On 30 March, work began on the walls after a solemn ceremony and a festive inauguration. “It was not an easy task to start the building,” the clergyman said. But “People had donated their hard-earned money to build it”. The whole process was difficult from the start. Although permits were issued two years ago, construction did not start in time and so new permits were required. Once this was done, work finally started. 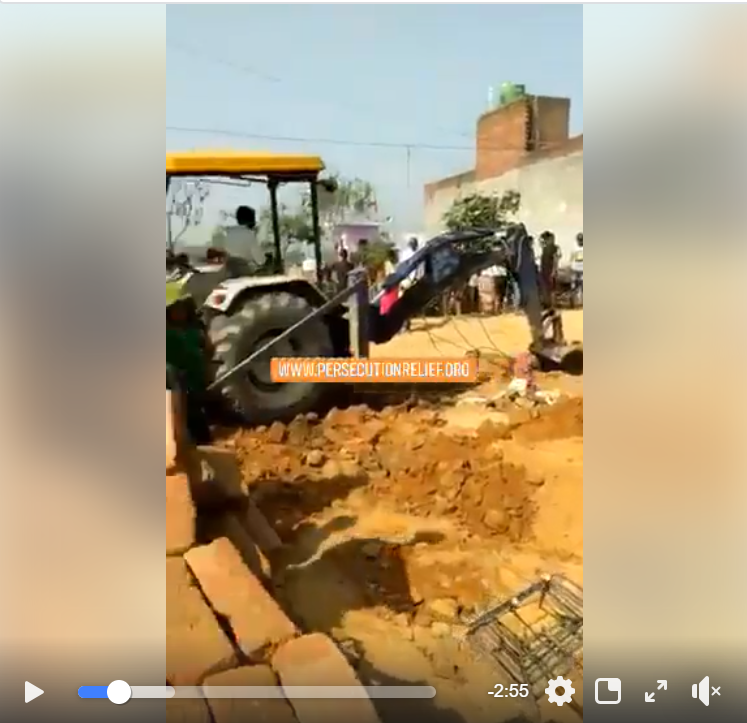 However, on the morning of 5 April, city officials, including Municipal Chairman Nagar Palika, as well as police came to the site with a bulldozer, which razed the three 5-feet walls that had been built. For Thomas, the chairman "is motivated by religious prejudice". Sadly, "The damage caused to the church, a symbol of religious tolerance, seems almost irreparable," explained Rev Abraham. Over the past few years, hundreds of churches and Christian-owned buildings have been razed to the ground across India “under the pretext that people are worshipping a foreign God”. Just last year, Persecution Relief has recorded more than 129 persecution incidents in Uttar Pradesh, the most hostile of India’s 29 states. In the first quarter of 2019, it recorded another 27 incidents of persecution in the state. For Shibu Thomas, the building permits were valid. Furthermore, knowing full well that the country is going to the polls, the local community did everything by the book to avoid situations like this. It is absurd “that the municipal authorities drove into private property with a JCB” (a mechanical digger). “When they came, they asked for the permit,” he explained. When they were shown the paper, “they snatched it from the pastor’s hands and took it with them”. There was only one copy, which complicates matters. And “some [Hindu] religious fanatics who live in the community” have now “threatened the pastor” and the members of the congregation. All this is possible in Uttar Pradesh because the “local government and politicians are involved,” Thomas said. “More than 25 churches are still closed with police guarding them, not allowing people to enter”. As a result, the community is devastated. For the activist, Christians have the right to profess their religion and must be respected.